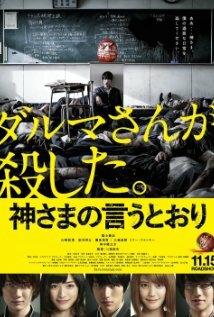 Movie Review: Prolific and talented, but often inconsistent, is how I see the Japanese film director Takashi Miike, who recently launched “As the Gods Will”, a loony computerized adventure targeting teen audiences, based on the manga work created by Muneyuki Kaneshiro and Akeji Fujimura, here adapted to the screen by the hand of Hiroyuki Yatsu. The film basically consists in a videogame, or if you prefer, a word-chain death game, with many different levels, whose players are High School students denominated ‘Children of God’. A certain day, and out of the blue, the head of a teacher blows up in the classroom being substituted by a Daruma doll that keeps bouncing on his desk while the heads of the students keep bursting one after another. This first level only finishes when someone pushes the button located on the back of the irritating doll, before its clock reaches zero. Highly popular among the girls, Takahata Shun (Sota Fukushi), who first complained to God about his boring life, is the student showing more capabilities. His strongest opponent is a tricky boy he has met at a videogame store, called Amaya (Ryunosuke Kamiki). The film starts and finishes as pure nonsense, a distasteful goofiness that increases from level to level. Its absurd episodes include a big cat in a gym, eating students dressed as rats and yelling ‘scratch me more, meow’; a flying white cube that could be related to terrorism or aliens; four playful Japanese dolls that punish with death the player who can't tell which of them stands behind his back; an allegedly pure white bear who demands the truth; and the final stage whose tedious game is called ‘kick the can’. Miike sets up some great scenarios but plunges into absurdity with a plot that revealed to be a complete disaster. I don’t know about the Gods, but my will regarding this one is: ‘game over’.